My science fiction series “After The Darkness“ is now on sale for .99 cents per episode. As I prepare to release the final two episodes of the first season, I’ve lowered the price to allow new readers an opportunity to catch up. There are four episodes available now on Amazon, Barnes & Noble, iBookstore, Sony and Kobo. Description: In a world of never-ending winters and permanent darkness, fourteen-year-old Nadia Comani faces a future of servitude. Can she free herself and her family? 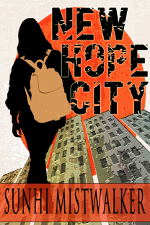 I will be reading from my novel “New Hope City” next month, please join me. Paperback versions of this book will be for sale and I will autograph your copy.